There are many things to consider when deciding which breed of dog you want to give a forever home. How big do they get? How much do they shed? Are they prone to health problems? How difficult are they to train? Dogs that are difficult to train can be very time consuming and they require a lot of patience and consistency. Some breeds are more difficult to train than others and the Shiba Inu is considered one of the most difficult breeds to train. People fall in love with the “fox” look of the Shiba Inu but are not prepared to deal with their larger than life and stubborn personality. Shiba Inus will only respond to activities that make sense to them and are very strong-willed and stubborn. They will fight back if feeling threatened and will not back down once they have their mind set on something. Shibas have a singular state of mind and once they focus on something, they become obsessed and giving up is not an option. A Shiba will be willing to not eat, not get attention, not go on walks, and much more if they feel their pride is on the line. Understanding your Shiba’s personality will give you the upper hand in training this difficult breed. Below you will find some training tips to help turn your rebel pup into a model citizen! 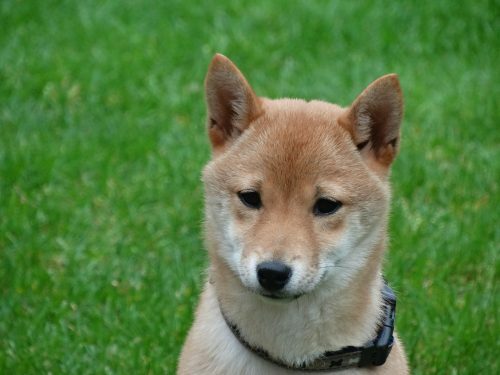 Shiba Inus are naturally clean animals which make them relatively easy to potty train. They dislike soiling their living space so they will opt to do their business elsewhere. The first and most important step in the potty training process is to set a schedule. Shiba Inus are creatures of habit so consistency is a surefire way to guarantee success. Closely observe your pup to identify his potty behavior. Maybe he has to go right away in the mornings and right after lunch. Maybe vigorously playing will trigger the need to go outside. Each puppy’s schedule will differ depending on their size, temperament, and routine. Letting your dog outside often will reduce the chance of mistakes. Dogs will repeat behaviors when they get positive results and stop behaviors when they get negative ones. This is called conditioning or reward training. The more you reward your puppy for eliminating outside, the more he will repeat that behavior. Giving your pup positive affection and a treat only associated with a potty success will encourage him to continue the behavior. Similarly, if your puppy tries to eliminate inside, saying “No!” and interrupting him to take him outside will discourage your dog from doing it again. Soon your puppy will learn that doing business outside is rewarding while doing it inside results in being interrupted. Another method of potty training is called crate training. Since Shiba Inus dislike soiling their living space, when they are in their crate they will avoid eliminating unless it becomes absolutely necessary. Once an hour, take your Shiba to the area you want him to go to the bathroom. If he doesn’t, bring him back to the crate and repeat the process until he does his business in the right area. When your dog goes to the bathroom, praise him profusely and the excitement in your voice will help your pup understand where you want him to go. Remember to be persistent, consistent, and show lots of patience! Shiba Inus are naturally dominant and need to be provided rules that are consistently enforced. Set and enforce the rules as early as possible so no bad habits are developed. Every owner will have different rules that are important to them but rules such as “no biting”, “no begging”, and “no jumping” are common. The Shiba Inu is a social animal that responds to a dominant subordinate hierarchy. Creating these rules will establish you as the “Master” and your Shiba as the “Follower”. Consistency in obedience training is as important as it is in potty training. Your pup may recognize the word “walk” and associate it with getting on his leash and going outside but that is only because it is a common action. If you change the verbal word you use, your Shiba will no longer understand. Whatever word you choose to use for basic commands, make sure to keep them consistent. Using the reward training method and encouraging desired behaviors with a reward and discouraging undesired behaviors by taking away a reward, have proven to be the most successful way to train the Shiba Inu. People may think that since the Shiba is such an independent thinker they would respond better to aversive dog training, but it can make them more aggressive. The secrets to training your Shiba Inu are to use reward training, always be firm but fair, and to simply exercise an extreme amount of patience. “How to Potty Train a Shiba Inu Puppy.” WagWalking, 25 Jan. 2018, Accessed 16 Sep. 2017. www.wagwalking.com/training/potty-train-a-shiba-inu-puppy. “Shiba Inu Dog Breed Information, Pictures, Characteristics & Facts – Dogtime.” Dogtime, Accessed 16 Sep. 2017. www.dogtime.com/dog-breeds/shiba-inu. Kriss, Randa. “Shiba Inu Dog Breed Information.” American Kennel Club, 6 Nov. 2017, Accessed 16 Sep. 2017. www.akc.org/dog-breeds/shiba-inu/. “Shiba Inu.” PedMD, 21 Nov. 2018, Accessed 16 Sep. 2017. www.petmd.com/dog/breeds/c_dg_shiba_inu. “Shiba Inu Dog Breed.” Petwave, Accessed 16 Sep. 2017. www.petwave.com/Dogs/Breeds/Shiba-Inu.aspx.